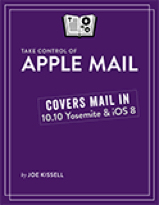 This ebook covers Mail in both Yosemite and IOS 8. It does include a free extra that lets you download the first edition, which covers Mail in Mavericks and IOS 7 if you still are using that. It also includes a chapter on avoiding email overload; the article where he first introduced it won American Business Media’s Neal Award for Best How-To Article. As is usual with these Take Control books, the author points out the bugs and missing features and often has suggestions for workarounds. It won't bore you with basic tasks that you either know how to do already or can figure out easily; this covers the problems and less than obvious things. Free sample with Table of Contents, Intro, Quick Start, and section starts.